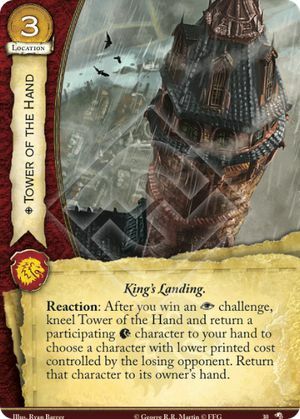 Reaction: After you win an challenge, kneel Tower of the Hand and return a participating character to your hand to choose a character with lower printed cost controlled by the losing opponent. Return that character to its owner's hand. Wolves of the North #30. You need to have a valid target (an opponent's character) in order to trigger the Tower's ability. First you pay costs (kneel Tower and return a character to your hand), then your opponent can cancel the effects of the ability (e.g. via Treachery). The costs are paid in either case. If you use a duplicate to save your character from returning to hand, the ability is aborted, and its effect does not resolve.